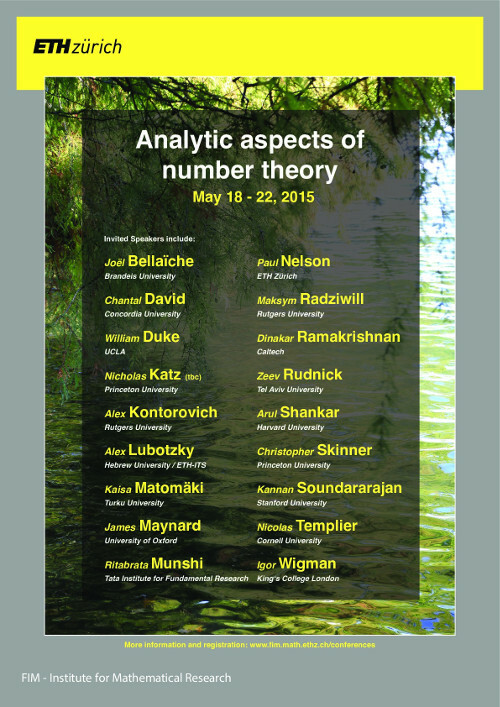 With the support of the Forschungsinstitut für Mathematik of ETH Zürich, we are organizing a conference on the topic of Analytic Aspects of Number Theory. This conference will highlight some of the very best achievements and research directions in arithmetic that involve some analytic aspects in company with other tools or ideas, including interactions between number theory and areas of modern mathematics like algebraic geometric and automorphic forms, geometric group theory, probability theory, harmonic analysis and theoretical computer science. The titles and abstracts of the talks are available on the FIM page. The schedule can be found here. Some amount of financial support is available for junior participants. Please fill-up the registration form before February 6, 2015.